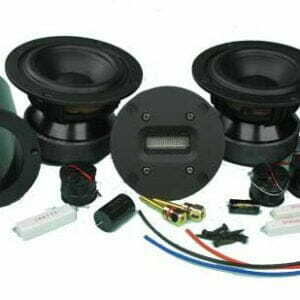 SKU: stbb Category: Speaker Kits Brands: Campbell - Holtz. One of the more popular full range kit systems that seem to captivate the speaker forums. The vented box system measures 60″ tall including the base, 11.5″ wide and 16.5″ deep. 2 x Crossover parts, featuring Audyn Q4 and Solen Capacitors, Lynk resistors, and specified inductors. Completer plans – Sealed and vented designs. Capacitor, wire, etc. upgrades are welcome. Please call to discuss. An optional, plans for a sealed cabinet are available at only 40″ tall. A professionally assembled crossover is also an available option.